ARTIST Bruce Munro is known for his impressive light installations with artworks shown all over the world but it all began at Uluru in Central Australia. Here Munro talks to TLTB about the travel experience that inspired it all. 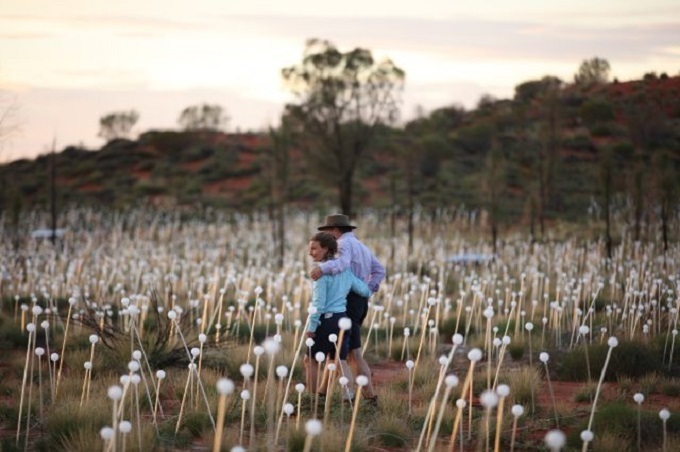 Twenty-four years ago, British artist Bruce Munro visited the Red Centre in Australia and was so inspired by the landscape, that it influenced his work from then on. "I know it sounds clichéd, but it changed my life," Munro says. He found himself feeling a deep emotional and artist connection to the vastness of the desert and to its colours and iridescent light. ‘The red desert had an incredible feeling of energy. Ideas radiated from it along with the heat”, he says. Munro travelled to Uluru (Ayers Rock) in 1992 with his then fiancé, now wife, Serena after living for eight years in Sydney. "Driving up to see the rock was one of the very last things we did before returning to Britain, we drove an old Toyota Corona and it got us there," Munro says. Every evening he pulled off the endless Stewart Highway and pulled into a camp site. Quietly meditating before sleep he began to conceive of an idea that would inspire him for years to come. ‘The red desert had an incredible feeling of energy. Ideas radiated from it along with the heat”. 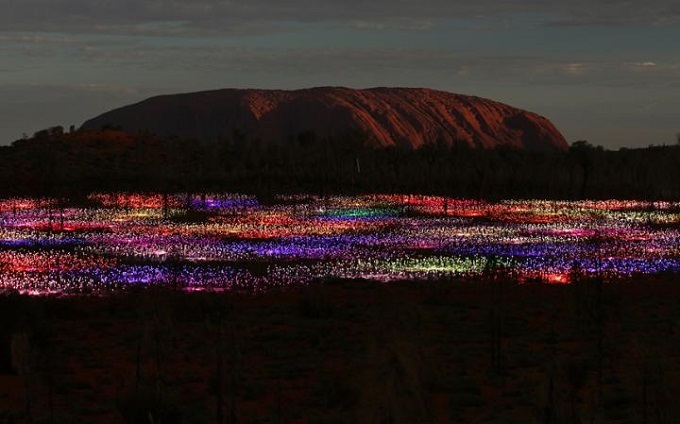 It was while camping at Uluru itself that he imagined an artwork that would bloom at night, like desert seeds responding to rain and recorded the idea in his ever present leather-bound book. "I made a few sketches in my notebook - and the image of that beautiful rock has always stayed with me." As he sits and talks to TLTB Munro still has a black leather notebook beside him like a talisman, ever ready for him to ink in ideas and feels the moment they come to him. ‘I wanted to create an illuminated field of stems that, like the dormant seed in a dry desert, would burst into bloom at dusk with gentle rhythms of light under a blazing blanket of stars’, he explains. Ironically the Field of Light first blossomed in cloudy London at the Victoria and Albert Museum in 2004. Then a larger outdoor version was conceived in ten acre Long Knoll field behind the artist’s studio. The Field was ‘planted” again in Cornwall, then in the USA in Nashville and Philadelphia. Now however his art has come full circle and the largest Field of Light ever created is blossoming under the infinite gaze of Uluru. Voyages’ Executive GM Sales, Marketing and Distribution, Ray Stone heard Munro on the radio and decided it was time that his dream came home to where it began. Stone felt that - just like another field of dreams -“if you build it they will come. So with the help of Voyages, Qantas (which transported thousands of globes from the UK without breaking a single one) and Investec, the impossible happened. Almost a quarter of a century after the idea began to germinate Munro is back at The Rock. 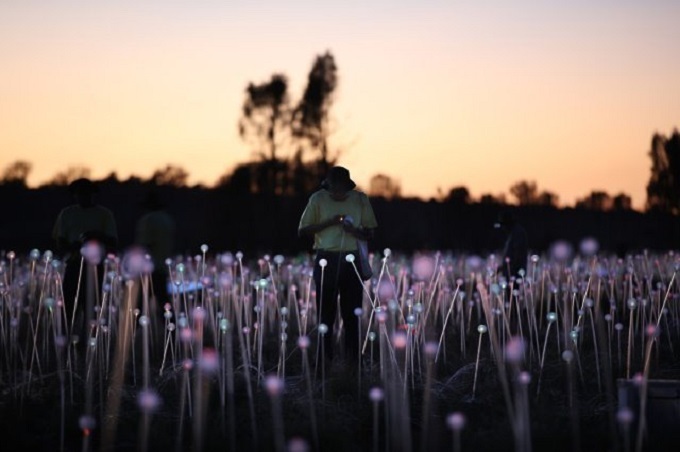 In keeping with the desert’s vast scale, he and his team have installed an incredible 50,000 frosted-glass spheres on slender stems connected via illuminated optical fibre. As darkness falls over Australia’s spiritual heartland the bulbs glow with iridescent ever-changing colour. 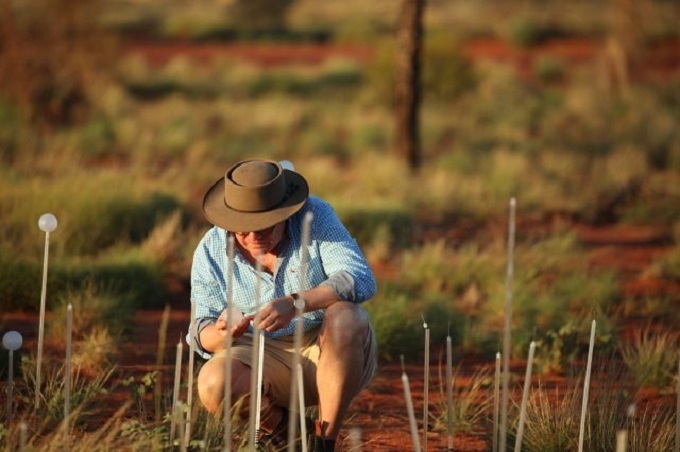 "I was bowled over by the opportunity to bring the Field of Light to Uluru. It is a personal symbol for the good things in life." Says Munro.” I chose the pallet – red, purple, gold, white and green - to reflect the natural colours of the desert landscape”. “There is something special about seeing the stems in this powerful, raw landscape” says Munro. “ I hope the installation helps visitors experience the infinite nature of this land. I like the idea of something so temporary set against the desert and the ancient rock. And also the] thought that we can be inspired by something much bigger than ourselves - that is this place. Hopefully this huge, huge red rock will inspire other people as it inspired me". Munro is modest about his own work. "I got a feeling as a young bloke which inspired a piece of work - I'm passing on a feeling". The local aboriginal Anangu people, certainly think Munro's work embodies the spirit of Uluru. They don’t bestow names lightly yet they have embraced the installation and its spirituality and called it Tili Wiru Tjuta Nyakutjaku , which in the local Pitjantjatjara language means "Looking at lots of beautiful lights". Back to visit Australia Munro is still struck by the quality of the light. “Australian light is visceral , creating either the most extreme colours on the planet or midday washed-out pastel,” he says. “I like the effect of the illuminations but the natural light also creates the experience. My favourite time might well be sunrise when the light shines through the clear globes as dawn breaks.”.